RESIDENTIAL projects include private homes, condominiums and apartments. For mixed-use projects see COMMERCIAL work. A 2,200 square foot residence in the sagebrush and juniper landscape of central Oregon exposes its board-formed, tinted concrete walls and wood framing to fit in with its surroundings. shed roof slopes in two directions to minimize the effects of trade winds. 3,000 square foot residence framed with wood. 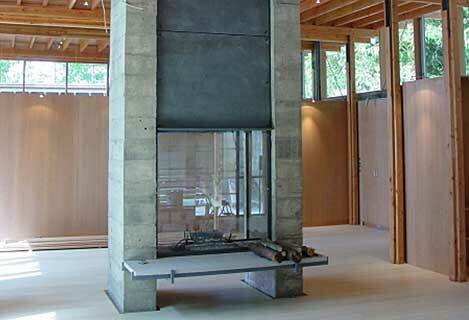 Residence featured studless corners, 16 ft wood and steel framed window wall, and custom framed glulam column connections. 3,500 square foot one and two story residence combines post and beam and a stud framing. The residence is divided into three separate wings: study/master bedroom, living/kitchen, and guest wing. Beams consist of built up glulams and solid sawn members. The posts consist of laminated solid sawn, steel, and glulam members. The lateral system for the residence uses several systems: rod bracing connected to partial height concrete walls at the perimeter of the building, interior shear walls, a structural chimney, and prefabricated metal shear panels.